Judging from previous years’ production, the spectacular Dance Arena stage at the globally acclaimed EXIT Festival will once more push the envelope. Carl Cox already confirmed his return to one of the greatest electronic music stages in the world, and now other leading headliners of today will join him in Serbia on the first weekend of July. Even with more names to come in the following weeks, EXIT seems to be gathering its strongest techno and house lineup at the colossal Arena! It will feature a 2-hour live set by one of the greatest techno producers, the Berliner who packs up stadiums with ease – Paul Kalkbrenner! His live set in front of half a million people at Brandenburg Gate in 2014 is now firmly a part of the music history. Electronic heavyweights will share ranks with new age heroines Amelie Lens and Charlotte de Witte, who have gone a long way since their teenage days in Belgium. Thanks to their true love of music and playing numerous sold out shows around the planet, they both became global superstars and a unique phenomenon of today’s music! Also joining the bill will be Detroit’s virtuoso Jeff Mills with his signature futuristic techno sound in the setting of the magnificent Petrovaradin Fortress, where one of Europe’s major festivals is held each summer. The great Maceo Plex, an ultimate headliner of the greatest festivals and a producer of impeccable sound who singlehandedly changed electronic music and erased genre divisions, is also arriving to one of his favorite stages. As almost a resident at the Serbian festival, once in a documentary about the Dance Arena, he told how he used to wonder whether he will play at EXIT! Another superhero who looks forward to the Arena is Boris Brejcha, a German producer with his recognizable “joker” mask, who created his own sound dubbed “high tech minimal” which has since become one of the most popular styles. For the first time ever, the overwhelming sight of EXIT’s Dance Arena will fall in hands of Peggy Gou, the rising Korean star whose music selection and the sheer feeling for the floor many consider to be nothing short of sensational while her single “Itgehane” marked the last year in the eyes of critics and fans alike. But perhaps the most emotional debut this year’s Arena will be that one of Dax J, who holds some of the loudest accolades from fans worldwide, together with all the leading media and the biggest festivals. He will be marking exactly 10 years of winning EXIT’s DJ competition as an anonymous artist back in 2009 which earned him his first EXIT performance at one of the festival’s smallest stages! Another strong debut at the Arena goes to the powerful Monika Kruse, a German techno boss who runs one of the most important record labels in the world – Terminal M.
After numerous demands and at a time when they are on top of their game, the popular tandem Adriatique will be making their way to the trenches of the Petrovaradin Fortress, followed by two rising stars and one of the most exciting live acts of the moment, Johannes Brecht and Satori! Coinciding with the rise of the regional scene, the strongest resident lineup this year comes from the top of charts, standing shoulder to shoulder with the headliners! Among them are the No.1 regional duo, Mladen Tomić and Siniša Tamamović, top selling producers from Bosnia, as well as the Serbian local hero, Ilija Djoković, whose hit single “Atom” is at Beatport’s top spot right now! Croatian producer Lawrence Klein and Bosnian DJ Forniva, as well as the Serbian tandem Miloš Vujović and Ranchatek whose music is published by Carl Cox, will be bringing more powerful b2b sets! Arena will receive an influx of fresh local faces too, such as Runy and Coeus, whose production is played by the Tale of Us and many other top acts! 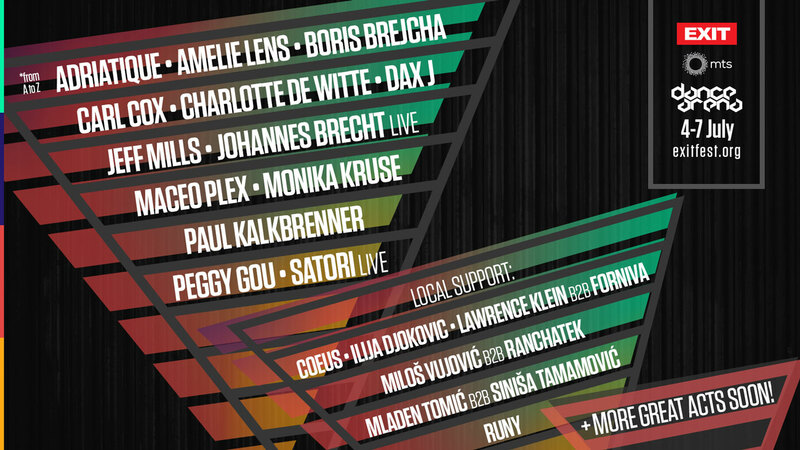 Local flavor meets world stars at Exit festival’s Main stage! Clean Bandit and Roni size reprazent celebrate exit’s 15th anniversary!